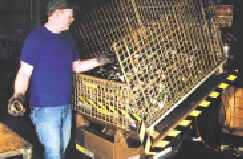 Autoquip has been a leader in Material Handling Manufacturing for many years. Since its inception in 1947 Autoquip has grown by leaps and bounds in Work Station and Assembly Equipment. The Series 35 Tilter brings parts and hard-to-reach objects where they are needed, within easy reach of a worker. The tilter reduces the need to reach and bend over, which are the leading causes of back injuries. 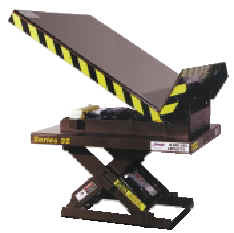 Typically tilters are used to access bins and baskets of small parts in assembly. POWER SUPPLY The electric motor is internally mounted. It is available in either 1 1/2 hp three-phase or 3/4 hp single-phase, with 24V AC control voltage. A number of "customized" engineering plans are already on file for the STE Series. Additionally, Autoquip offers computerized engineering services for development of "one-of-a-kind" ergonomic tilter applications.